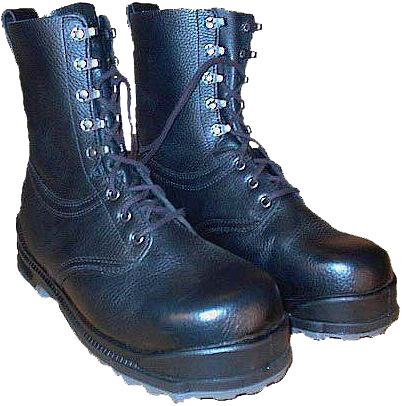 The design of the Swedish marching boots represented in the picture below. The top is made of thick but flexible "grainy" hydrophobic leather. The flap of the tongue is "closed", i.e. Stitched down almost to the top of the boot. The lacing system is provided by three pairs of simple round eyelets at the bottom and five pairs of "MARK"-labelled bronze eyelets of speed-lacing system. Between these elements of the lacing system construction the cut-out is provided to make the legs bending easy. 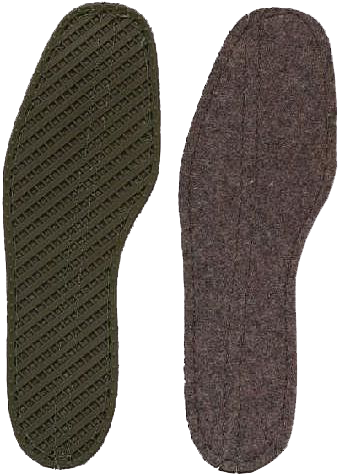 On the back side of the boot, the flat nylon textile "loop" is provided to keep in position the textile lacing, wrapped around the boot. 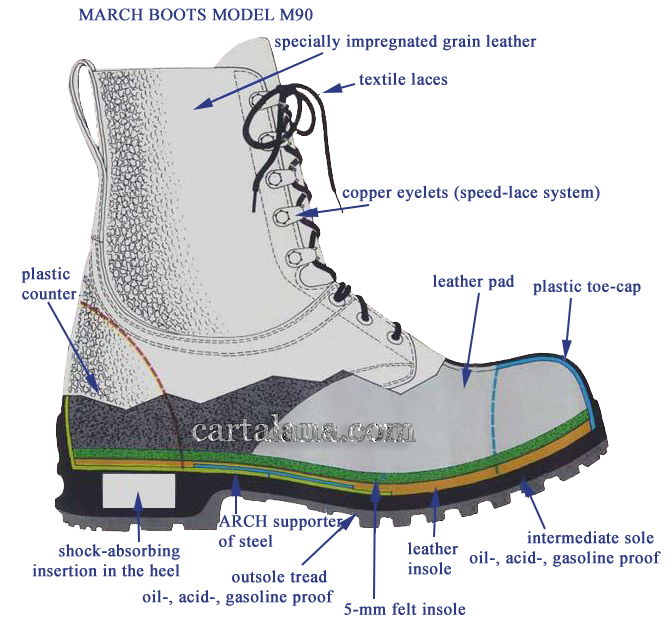 This is typical Swedish design boots, with half-round stitches below the malleolus bones level, showing the border between the insulated and not-insulated parts of the boot (the upper part of the boot has no insulation). The toe and the counter of the boot are reinforced, respectively, with plastic "toe-cap" and plate. 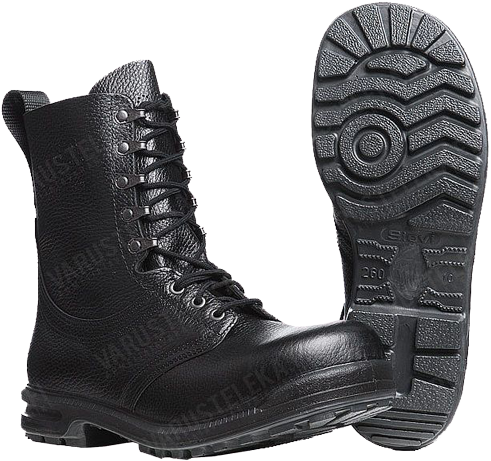 The leather out-sole is reinforced with steel-plate arch support. The heel features the shock-absorbing cushioning, while the out-sole itself is composite in construction, and is made of polyurethane foamy rubber and nitrile rubber. 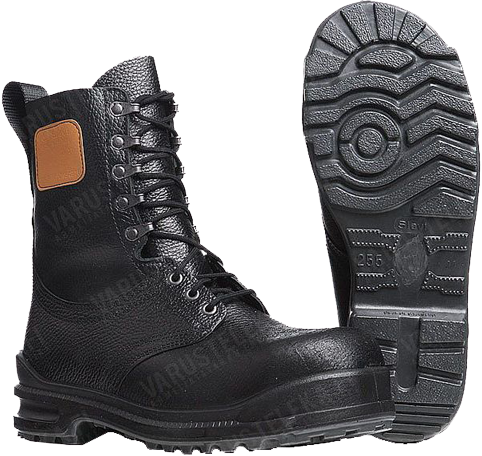 Usually the Swedish military boots are supplied with two insoles, the first one is made of thick felt and the second one, is thinner and made of textile with antibacterial impregnation. The tread pattern is of an original Swedish design. The marking on the out-sole indicates the manufacturer's name, the size of the boots in "Mondopoint" system (in mm), and bears the Swedish "Three Crowns" logo (which should be obligatory eliminated (cut off) from the boots out-sole in the case when such boots are designated for civilian market sale. 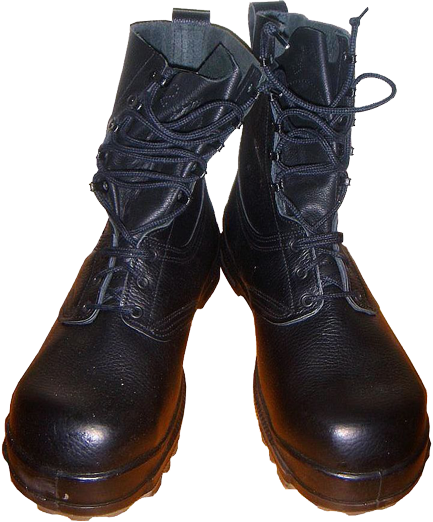 The Swedish winter army boots of model M/90 generally correspond to the design of summer "marching boots", with the addition of thermal insulation layers. 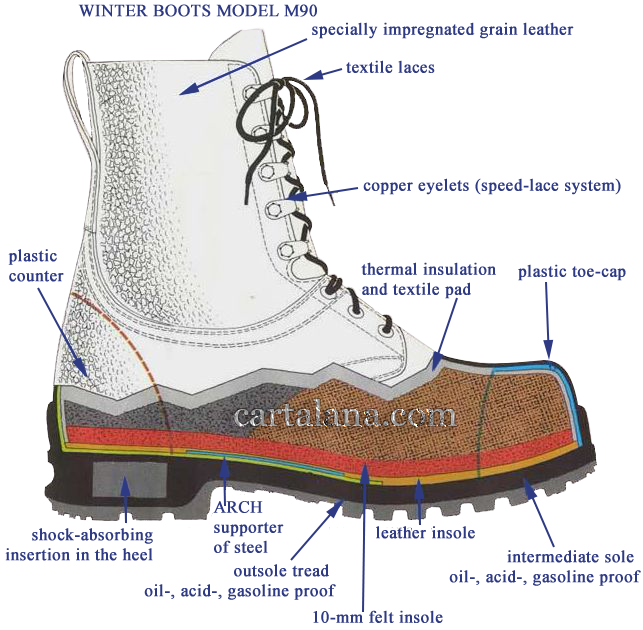 The felt in-sole is of double thickness (10 mm in "winter" boots vs 5 mm in "summer" model), the out-sole is oil- acid-gasoline-resistant. The nitrile rubber out-sole is light grey in colour, it is good for both normal and low temperatures. On the Swedish discussion forums one can read that the quality of Swedish army boots has deteriorated in the recent decade. There are some suggestions that this is due to the transfer of production capacities somewhere to the South-East Asia, and the purchase of the footwear components there. It is hard to say whether it is true or not. We can say only that the labels on the Swedish M/90 camouflage uniforms indicate, that the uniform pieces were made in the countries like Indonesia, China, Vietnam, Sri Lanka, Tunisia or even Poland.